"No trust dark worm N'Gasta. Powerful, yes, is N'Gasta -- but wicked. Soulstealer. Old and evil." Little is known about N'Gasta's life prior to his arrival on the isle. Rumors in the Third Era suggest that he once had a wizard's tower in Vvardenfell. The High King of Hammerfell, Thassad II, allowed N'Gasta to occupy the tower west of Stros M'Kai in the better years of his reign. Presumably around the same time, N'Gasta's liege-lord, the King of Worms, granted him the surrounding area to practice necromancy. Up until the end of the Redguard civil war in 2E 864, N'Gasta was "but a tale in passing, a shiver in riddle". At the end of the war, N'Gasta set his soul snare over Stros M'Kai to capture the souls of spirits either unprotected by holy rituals or buried in unhallowed ground. Many of these he offered to his patron Daedra Lord Clavicus Vile in return for favors. The new provisional governor Richton did not restrict N'Gasta's practices, believing him to be a better friend than enemy, and this policy enabled N'Gasta to become very powerful. Three months before Cyrus arrived on Stros M'Kai, his sister Iszara visited N'Gasta seeking help to restore Prince A'tor from a soul gem. N'Gasta agreed to offer his services in exchange for Iszara's soul, an offer she accepted. Typical of his behavior, he lied and kept the soul gem for himself, fashioning it into an amulet that appeared to be a red diamond within a dragon setting. He intended to deliver this to Richton to acknowledge the governor's generosity and hired a middleman to find a courier. Either through this middleman or on his own, Cyrus arrived at N'Gasta's tower and accepted the job to deliver the amulet, unaware of its true nature. In time, he learned that Iszara had sought out N'Gasta's help. He discovered the location of the legendary Flask of Lillandril in order to defeat N'Gasta should he turn hostile. 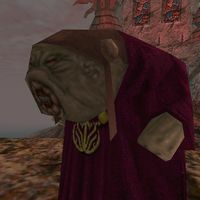 At the top of his tower, N'Gasta appeared and revealed his actions, including that Iszara's soul was sent to Clavicus Vile. Utilizing the flask, Cyrus managed to kill the necromancer and then opened a portal to Vile's realm and rescued his sister. As Cyrus stated during their confrontation, it is quite possible that N'Gasta was caught in his own soul snare. N'Gasta's legacy lived on even into the Fourth Era through his book N'Gasta! Kvata! Kvakis!, most likely a work about necromancy. This page was last modified on 21 October 2018, at 08:26.